Bossard Memorial Library has microfilm records of Gallia newspapers in the mid-1800s among its other information available to the public. 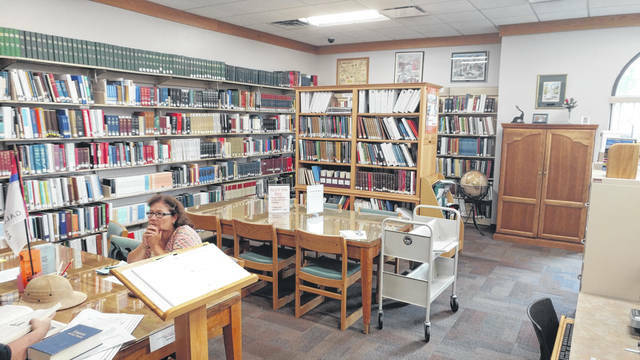 GALLIPOLIS — Bossard Memorial Library will be spending its Aug. 25 from 9:30 a.m. to 3:30 p.m. teaching Gallia and any who wish to learn how to study their own genealogy. According to Adult Programming Associate Lynn Pauley, she will teach the day’s opening presentation “How do I begin: Beginning Genealogy.” She says she has over 40 years of experience researching genealogy as she started studying her own family tree in junior high. Bossard’s Randall Fulks is anticipated to teach the second part of the day’s programming with Pauley. These databases include Ancestry Library Edition — which is only available from inside the library, and the following databases are available from home with a library card — Fold3, Heritage Quest, Sanborn Fire Insurance Maps, Archives Unbound County and Regional Historical Atlases of Ohio, a new database African American Heritage and the library’s digital newspaper archive, said Pauley. The Gallia County Genealogical Society as well as the John Gee Black Historical Center are anticipated to be present to speak with visitors who wish to learn more about their past and how to start. The Gallia Genealogical Society has access to county wills and estates dating back to the 1800s and the John Gee Black Historical Center has documented and taught the history of Gallia’s Underground Railroad.